Since I am stuck here sidelined from training for The Next Big Thing, I thought I would regale you with tales from bucket list items I have recently been able to check off as complete. 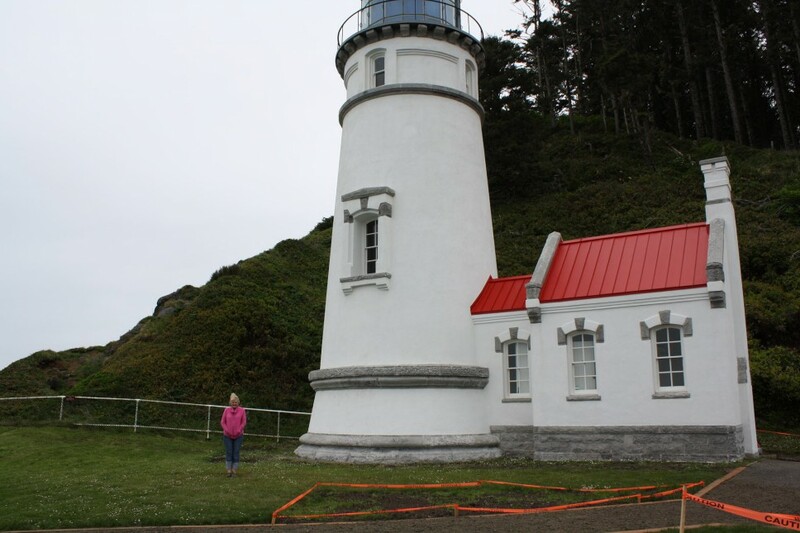 Heceta Head Lighthouse was to be the crown jewel of two weeks of jewels. I had planned my trip very carefully (that’s part of the fun) and had amassed a rather eclectic collection of hotels, motels, and B&B’s with the only pre-requisite being that it had to be on the Pacific Ocean’s shore (the first week anyway, I took an inland route home). 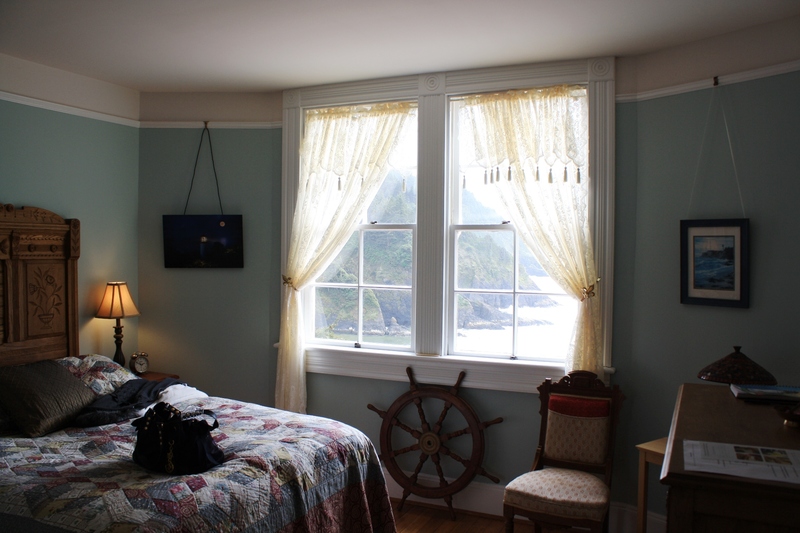 Spending the night in a Lighthouse (keeper’s house) was a bucket list item within a bucket list item (the PCH experience). I had looked forward to it since leaving my home in Southern Cali, and just couldn’t wait to see it up close and personal. It didn’t disappoint. In fact, pictures cannot do it justice. I had checked in fairly early in the afternoon so set out immediately to explore the area. I didn’t know much about the history before I got there, which is out of character for me. I usually do quite a bit of research upfront on travel locations. Maybe because I had so much to plan for the trip, I knew I wanted to stay here so I booked it and moved on. I made the short walk up to the light house, and again I had my breath taken away. Coming from So. Cali., I am not accustomed to the ferocity of the sea battering the rocky Oregon shoreline. It is indescribably beautiful, but at the same time sends the message that it is in charge. One slip would result in certain death on the crags and rocks below, if not plunged fully into the ocean itself in which you would be battered to death within minutes. Whew, I almost scared myself there. No guardrails or fences here. This snapshot was taken on the way to the lighthouse. It can’t be seen from the house or the lighthouse even though it’s between them. Only when you are up close to it and this is as close to the edge as I get folks. Falling from this height into the ocean is most definitely not on my bucket list and is a value add I will most assuredly not allow if I can at all help it. The beach below my window (Devil’s Elbow State Park, hmmmm I should have known something was up) was my next destination and again, words cannot describe the beauty of the Cape Creek bridge, Cape Creek emptying into the ocean, and the ocean and shoreline beyond. There were more than a few caves along the beach which I would have loved to explore, but it was high tide and I am more than a little respectful of the sea. I know what it can do and I will not challenge it. I went back to the Victorian. There is no food at the Lighthouse Keeper’s B and B (except for breakfast), and both Florence to the south and Yachats to the north were a bit of a drive away. That was fine with me. One of many unexpected perks of traveling alone was I didn’t have to worry about who was hungry and what they wanted to eat. I just made myself a PB&J and a couple of handfuls of trailmix (from supplies I had in my car), followed by a water from my little ice chest and I was good to go. There was only one other couple in the entire house. Mid-May is not tourist season, and in these parts (at least for me), it was dang cold. I sat in the parlor while they made their dinner in the guest kitchen. I should explain why this particular Victorian is so unique. It was actually the Lighthouse Keepers Assistant’s houses. A Victorian duplex if you will. 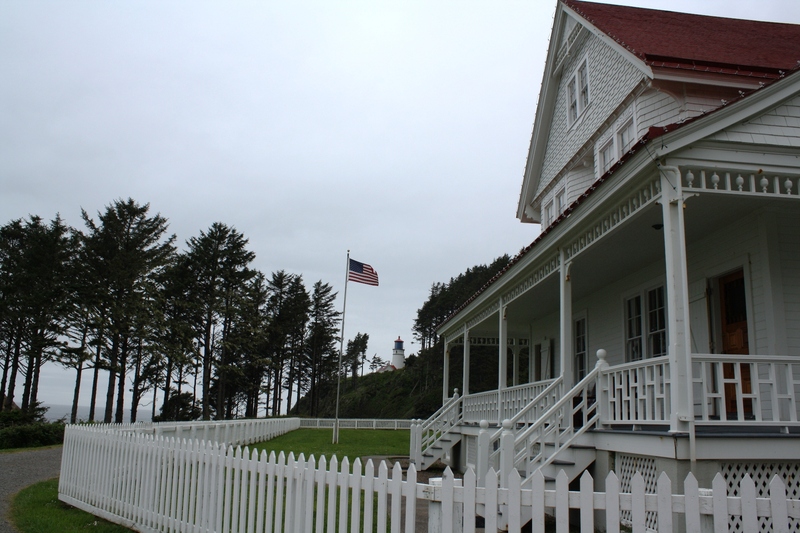 The Head Lighthouse Keeper’s house was demolished in 1940 and the lumber used to build a café in Mapleton, Oregon. 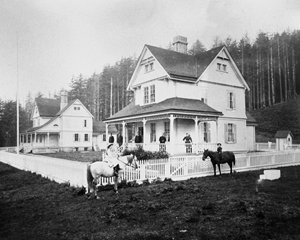 This photo was taken in 1900 of both houses before demolition of the foreground house. The Assistant’s duplex (background)was actually designed from a single plan and doubled in the interest of saving time and supplies since this place was so remote. It is still off the beaten path. Originally, the two identical homes were separated by a wall which was taken down by the B and B operators (it is actually owned by the State) to make a single dwelling. That being said, there are still two identical kitchens – one can be used by guests, while the one on our side of the house was used exclusively by the chef. The proprietor was gone as soon as both parties were checked in. He mentioned that there was a woman on site that lived in the basement (accessible only by outside stairs), but that we wouldn’t see her unless we needed her (getting locked out, etc.). We had the entire 6 bedroom, 2 kitchen, 2 living room, 4 bathroom house to ourselves. I got to know the other couple. A thoroughly delightful pair from Canada (actually he was originally from Australia with his dreamy accent) who were there celebrating her graduation from medical school. In the above photo, my room is the right hand set of double windows on the second floor. The attic windows are the double set on the third floor. The lighthouse is in the background. The rocky coastline follows the road around to the lighthouse, and around behind where I am standing to take this photo. 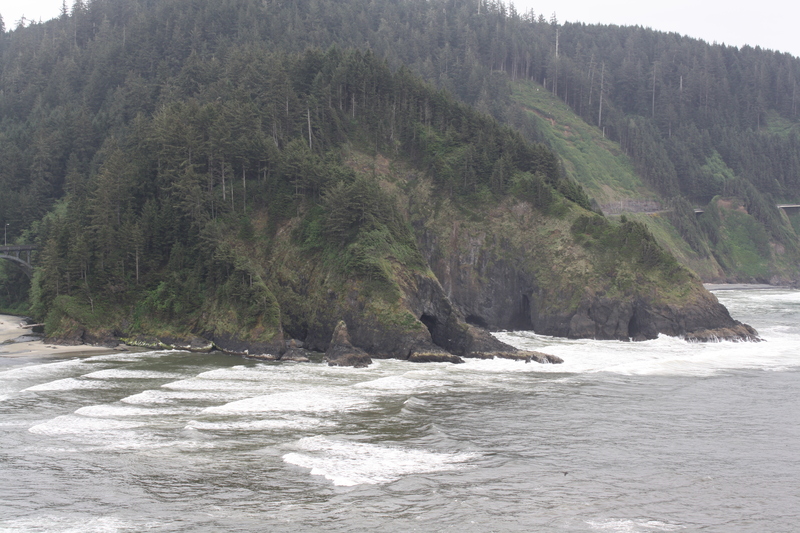 Heceta is a large outcropping of rocky coastline named for the Spaniard who discovered it in 1755, and evidently lived to tell about it. After my new friends ate dinner, we started out sitting on the glorious front porch, but because of the cold moved into the parlor. We lit a nice fire and chatted while they played a board game. I must comment on the change in weather. While Oregon (at least for my trip) was not sunny So Cal by any stretch of the imagination, it had been partly sunny when I arrived. As the day started to wane, the waves had become even more violent, the sky ominous, and it became bone chillingly cold. Even though it wasn’t raining, everything was wet and slippery. Not a place I would hike in the dark that’s for sure. I got a feeling for what a lighthouse keeper’s job really must have been like. Not as glamorous as I had imagined. While we were chatting in front of the fire and watching the storm roll into our little slice of Pacific Coast heaven, the subject of the house being haunted came up. Exsqueeze me….did you ask me if I knew the place was haunted? Ummm, no. I certainly did not. The male half of this couple told me to not pay any attention to her, she was the type that if there was one shark in the ocean she would expect to get bit. Oooooookaaaaay, but this house was a bit smaller than the ocean. This would be like a shark in your swimming pool. Pretty good odds of an encounter I’d say. While this was slightly unnerving, I didn’t feel ominously threatened or that we were being watched or anything else spooky for that matter. When I finally got home 2 weeks later, I googled it and is indeed considered one of the most haunted houses in America. Why didn’t I know that going in? Still a mystery to me since I am normally Miss Information. Not mis-information…nevermind. We invited the caretaker to have a cup of tea and chat in front of the fire which she cheerfully did. We got through the niceties and I went straight for the heart of the matter by asking about ghosts. I wish I had a cleaning ghost like that in my house. Be careful what you wish for…I know, I know. I learned from our host the life of an assistant housekeeper’s wife was horrible. She would be subject to surprise white glove inspections and scrutiny by both her husband and the head lighthouse keeper’s wife. No wonder poor Rue is still at it. This assuaged any fears of paranormal activity because frankly, who can be afraid of a ghost that doesn’t show herself and cleans? A couple of hours later we had talked ourselves out and all parties bade each other a goodnight. The Canadian couple and I headed up our steep winding stairs and to our respective bedrooms. This is my room pre-storm and dark. No frills but who needs a TV or computer with a view like this? As I laid down to read before falling asleep, I felt myself become melancholy which is not something I normally allow myself to indulge in. It’s a slippery slope, and I would prefer to dwell on happy thoughts whenever possible. And it’s always possible. I chalked it up to not being able to talk to my kids for a couple of days (one of which was Mother’s Day), and although I had been able to talk to my hubby the night before, and our conversation was most pleasant, it was still strained. I updated that I was safe on Facebook (the B&B has wi-fi) and got their well wishes on my timeline, but it’s not the same. Also it was my sister’s birthday, and while I usually try not to dwell on her untimely death (which leads to thoughts of the untimely death of her young daughter), maybe because of the storm and isolation my mood matched the grey turmoil outside. I propped the window up about a half an inch. Call me crazy, but when you love the ocean as much as I do the sound of it crashing below your window should not be muffled or restrained. It started to rain but was not coming in my window so I left it open a crack. I closed my eyes but thoughts of my little sister Susan persisted. A life so tragically interrupted (see Do They Know How Much I Loved Them for details). Because of the sudden loss of her young daughter, another life tragically cut short. I tried to redirect my thoughts to what was on my plate for the next day, calculated where I was on my trip, etc. but the darkness on the edge of my mind was still there. Then I heard music. Amidst the sound of the rain, the crashing surf, the thunder of the storm, I heard music. Not music from instruments, but music as if a woman was humming a melody. And it sounded like it was in my room. That couldn’t be. There was an old dial up radio in my room but it wasn’t on. I got up and put my ear to the vent thinking that it might be coming from the woman two stories down, after all old houses are like that right? Wrong, it wasn’t coming from there. It was following me. It sounded like something a woman would hum if she were trying to put a baby to sleep. Very soft and soothing. I know. Maybe the female half of the Canadian couple had gotten up to take a bath. The bathroom they used shared a wall with my bedroom. That had to be it. I opened my bedroom door and stepped out into the hall. The bathroom door was open and the light was off. Nobody in there. While I had stepped out into the hall, the humming had followed me and gotten even closer to my ear. Eerie, but I wasn’t going to panic because I was not out of options. It could be someone outside. I highly doubted it on a night like this, but you never know. I stepped back into my room and grabbed the flashlight provided in case of a blackout. I opened the window all the way and shined it outside. Nothing but rain and surf. I shuddered and closed my window and locked it. The humming continued, and moved when I moved. Phooey, time to panic. I jumped in bed and pulled my covers up to my chin and shut my eyes so hard I squinted. I had the overwhelming sensation that if I opened my eyes there would be a face within inches of my face. I knew someone was staring at me, and I knew it was close. Let me say I am NOT one that has a great deal of experience with the paranormal. I avoid invisible drama. I have enough tangible drama in my life without this kind of thing, thank you very much. I wasn’t alone in my room. I sensed the person walk around the outside of my bed and sit at the foot of the bed on the other side. I felt it move, and I was not moving. I am frightened out of my mind at this point. I am not sleeping this night, that’s for sure. Adrenaline is pumping like high performance racing oil in my veins. The humming stopped for a moment. It’s as if she was considering it. Then is started back up again, but never as close to me as before. About an hour later, the humming moved out of my room and out of ear shot. Finally! I awaited dawn which was only a few hours away at this point, as I laid awake with my eyes as big as saucers I’m sure. She didn’t come back, but I was waiting and listening for any sign of company. The next morning both the Canadian couple and I headed downstairs to breakfast at the same time (as it is served promptly at 8am). I told them about the night’s adventures. Surprisingly, they had adventures of their own. Evidently they kept opening their window to get air, and “Rue” kept closing it. Since it was a small wind out window, it was not possible to close on its own. At least they assured me it couldn’t. When the husband balked at his wife’s suggestion that it could be the ghost, he was promptly held down in his bed without the ability to speak or move. I’m glad I didn’t balk. The chef overheard our conversation at breakfast (it is 7 courses after all), and when the Canadian couple left to pack, she approached me about my story. She asked if I was in mourning or was sad about the loss of a loved one. I said I was, and told her about my sister’s suicide after the death of her daughter. “Ahhhhhhhhh, that’s it”, she said. “That’s what?” I replied. The chef said that it is thought “Rue” committed suicide after the death of her small daughter. Although there is no record of such history at the house, there was the grave of a small female child unearthed on the grounds. I could see it. I can’t imagine having to deal with unbearable grief while being cutoff from the rest of the world. And the sound of the never ending, nearly deafening crashing surf. While I love it, I think that it might become maddening without transportation to carry me away to silence once in a while, or iTunes and headphones. She would have had no options but to suffer alone. The chef went on to say that “Rue” has been known to try and comfort those that grieve for loved ones, especially children. Just a month earlier she had put her ghostly hands on the face of a female guest grieving over the death of her son. Was that what she was doing, trying to hum me to sleep? Trying to help me get my mind off of the loss of my sister and her daughter? Newsflash Rue…you are not conducive to sleep, but come to think of it, you did get my mind off of what I was thinking before you showed up. . They say she stays in the attic during the day…I was in the house alone within the hour, should I explore it? Should I try to tell her I’m alright? OH HELL NO. I’m not that girl. I was on my merry way within just a few minutes. 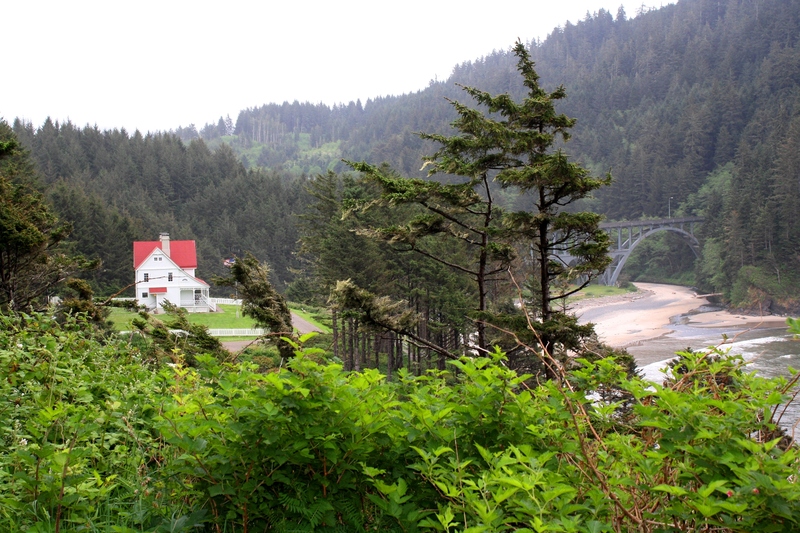 I would go back to Heceta Head Lighthouse in a hot minute with all of its beauty and history…but not by myself. Not without my hubby and an Ambien. Or two. This entry was posted in Bucket List, Bucket List - Value Added, Travel and tagged Baby Boomer, Bucket List, Bucket List Adventures, Bucket List Travel, Bucket List Value Added, Cape Creek Bridge, Dear Diary, Devil's Elbow State Park, Haunted Lighthouses, Heceta Head Lighthouse, Heceta Head Lighthouse B and B, Heceta Head Lighthouse Ghost, On Getting Older, Oregon Coast, Pacific Coast Highway, Paranormal, PCH Adventures, Retirement, Road Trip Adventures, Rue, Travel, Traveling Alone by ckdenson. Bookmark the permalink. 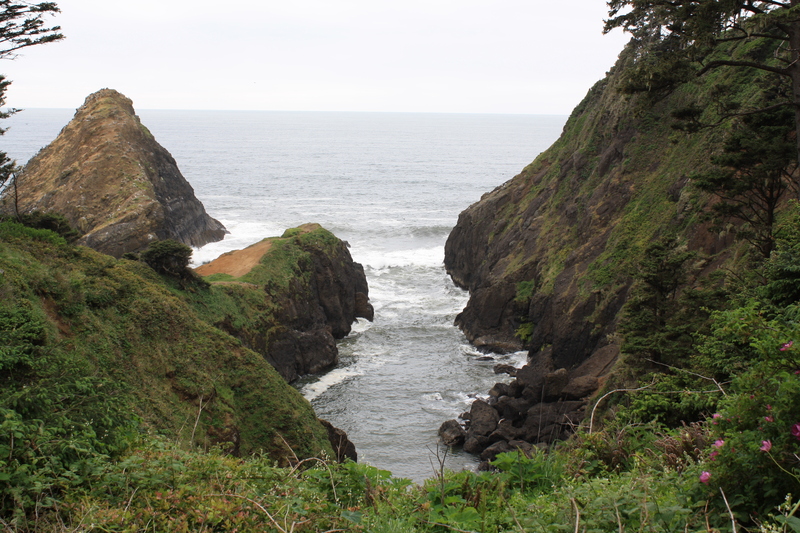 First, isn’t that part of the Oregon coast gorgeous? 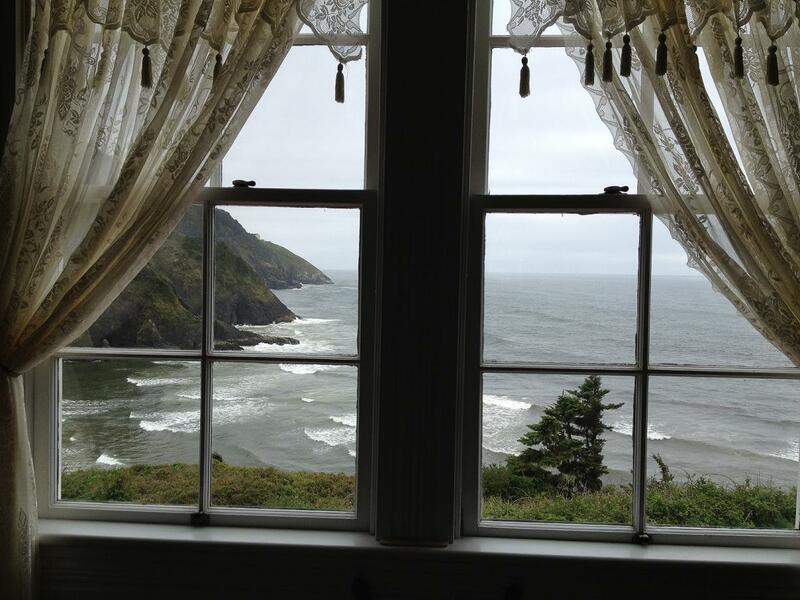 Memories of Yachats is my mental happy place when I’m feeling blue, and, like you, we slept with the window open to hear the surf. Second–Wow. Rue was obviously trying to soothe you but I think I would have slept in my car if she insisted on sharing my room. What a wonderfully terrifying experience. Rue’s story is spooky and heart warming at the same time. I can just imagine what you would have gone through! Very spooky Pootle! I would do it again though (I think).